With new offices on the 19th floor in the Sunning Plaza in Hong Kong, as of April of this year, AsiaSat�s AsiaSat-2 satellite targets customers in Asia and Australasia, the Middle East, and Europe. Offering multilingual and multicultural broadcast services, the satellite packs 24 C- and 9 (linearized) Ku-band transponders. In 2008, AsiaSat celebrates their 20th anniversary, having been established in 1988. 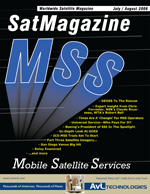 Their first satellite, AsiaSat-1, was launched in April of 1990 and was the first Asian private, regional satellite, pioneering satTV broadcasting in the Asia-Pacific region. Currently, the company offers three pan-Asian satellites, with AsiaSat-5 already under construction and set for launch in 2009. AsiaSat-5 will replace AsiaSat-2 when on orbit. The AsiaSat-2 satellite was built by Lockheed Martin Astro Space on their Series 7000 bus and was launched on November 28th in 1995 from Xichang, China, aboard a Long Mark 2E rocket. With global connectivity support, there�s instantaneous access to Asian terrestrial TV stations, cable networks, payTV platforms, and hospitality venues. The Pan-Asian C-band footprint spans an area ranging from Russia to New Zealand and from Japan to the Middle East and parts of Africa. Customers need only a small, C-band dish receiver sized from 1.8-meters. The company�s satellites are monitored and controlled 24x7x365 from state-of-the-art control facilities: Stanley Earth Station and the Tai Po Earth Station, located at the Tai Po Industrial Estate in the New Territories of Hong Kong. The latter station is the newest and consists of a 5,711 square meter, two-level building with four 7.3-m, one 11.3-m, and one 6.3-m antennas. Services offered include broadcast, telecommunications, VSAT network, multimedia and Internet, digital platforms (via MCPC-DVB platforms and partners in Cyprus and Israel) and occasional services, such as SNG (Satellite News Gathering). The service providers on AsiaSat for multimedia and Internet services include BtNAccess, REACH, and SpeedCast. And, just recently, AsiaSat was contracted by Eurovision to supply multiple transponders on AsiaSat 2 during the Beijing Olympic Games, being conducted from August 8th through the 24th. AsiaSat will play a key role in delivering Eurovision�s live TV coverage of the event in HD format to the the world. Eurovision has been using AsiaSat-2 as part of its global network since 1999 to transmit regular and ad hoc live video contribution and distribution feeds to its members and customers between Asia, Australasia, and Europe. These include the latest coverage of premier sports events such as the UEFA Champions League, top European national football leagues, Grand Slam Tennis and Motor Sports.